Inclusive Education Is for Everyone! Eagle Hill faculty Diana Mackiewicz, M.Ed, is speaking in Monterey, Mexico at a Mextesol Capítulo Nuevo León 2018-2020 on December 8th. 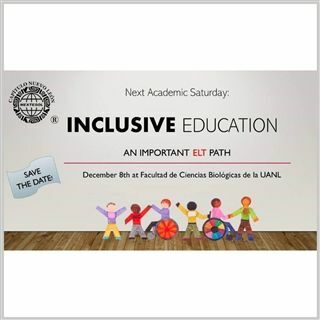 MEXTESOL’s "Inclusive Education, an Important ELT Path” conference will held at the Facultad de Biología, UANL - Academic Saturday. Invited by Mextesol to at the conference, Diane will present “Inclusive Education Is for Everyone!” Educators of all grades and ages can benefit from an understanding of how inclusive education is a philosophy and practice and not just a classroom environment. Teachers often instruct in specialized settings and may not have realized that they also shared an inclusive setting. The inclusive classrooms are stocked with modifications, encourage those who do not want to learn while maintaining engagement with other students. Building a sustainable teaching practice with a focus on inclusive education are explained. Professional examples and solutions will be introduced along with strengths and challenges for the inclusive classroom educator during the conference. MEXTESOL which stands for Mexico Teaching English second Language, was founded in 1973 by a group of English teachers interested in promoting and strengthening English language teaching in Mexico. More than 3,000 educators from around the world participate in this professional academic association which seeks to develop the highest standards for teaching English to speakers of other languages.